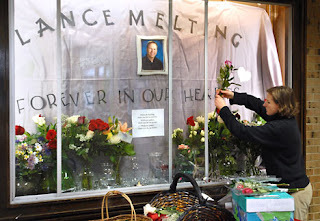 Our friend Lance Melting, a special education teacher in Longmont, died in a car crash on I-70 just west of the Eisenhower Tunnel on Monday, March 31, 2008. April 5 would have been his 40th birthday. On that Monday, we had flown to Chicago to spend spring break with Christine's family. We had just enjoyed a lovely dinner with Christine's sister Cathy and her boyfriend Ron when I got a phone call from a friend in Longmont. She told me that Lance had died in a car accident that day, and that they might not know for days exactly what had happened. We looked on the Internet and found that there had been a fatality on Vail Pass. We knew it must be Lance, but couldn't imagine why he would have been driving in snowy conditions. Eventually we learned that he was driving his wife Jamie and their four kids to a vacation in Disneyland. Apparently the weather worsened abruptly on the west side of the tunnel. Lance was the only fatality in a series of three pileups that involved at least 60 cars. Jamie was released from the hospital five days after the accident. She faces a long recovery, but I think she will recover fully. Fortunately, the children only suffered bruises and scratches. Lance worked with our son Joey, who has Asperger Syndrome, at Rocky Mountain Elementary School from kindergarten through 6th grade. Lance had amazing patience and empathy. Lance had to work with many kids, some with disabilities far more severe than Joey's, and yet we always felt that Joey got all the time he needed with Lance. I think Lance deserves a lot of the credit for the way Joey has turned into a kind, calm, thoughtful 14-year-old. Yesterday Christine, Joey, and I went to Lance's memorial service at Skyline High School. About 1,000 people attended. There was a performance of martial arts by students, including two of his sons, from a school in Boulder at which Lance had been a student since 1993. A number of family members and friends spoke. I hadn't realized what a jock Lance had been! I hadn't figured him to be a football or rugby player. Finally, there was a slide show of Lance and his family. He always had a smile on his face, even though he had an incredibly difficult job that requires an amount of dedication I can't fathom. Lance is survived by his wife Jamie Lathrop and their children Aaron, Andrew, Alex, and Abby. Contributions to the Lathrop-Melting Scholarship Fund, for the four children, can be sent in care of Ahlberg Funeral Chapel, 326 Terry St., Longmont, CO 80501. Lance was born one day after the death of Martin Luther King, Jr. I am consoled by the hope that somewhere in the world, a child was born this month who will do as much good as Lance did. He was one of the greatest people I have ever met.